Students who progress slowly and have poor intelligibility, possibly due to apraxia or phonological disorders, often have language difficulties, too. It is kind of a catch 22- the kids with mild speech delays , thus less to work on, are the ones who usually respond quickly to therapy and go on their way, but the students who struggle with making themselves understood have to work so long and so hard! While I have worked with some just “artic” kids, the majority of my caseload over the years has had combined problems. So, I’d like to share with you one of my hints for combining articulation and language goals when working with younger students. Start with a great book! I love to use books in therapy. If you’d like to see some of our favorites, be sure to check out this post. After choosing a book, it is time to figure out the language you can elicit and the words you want to target for speech practice. 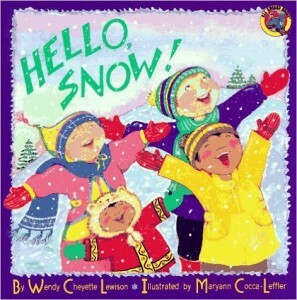 One book I loved to use when I was in preschool was Hello, Snow! by Wendy Cheyette Lewison. Here’s what I found to be easy to target. This example was pretty straight forward since it just looked at individual sounds. 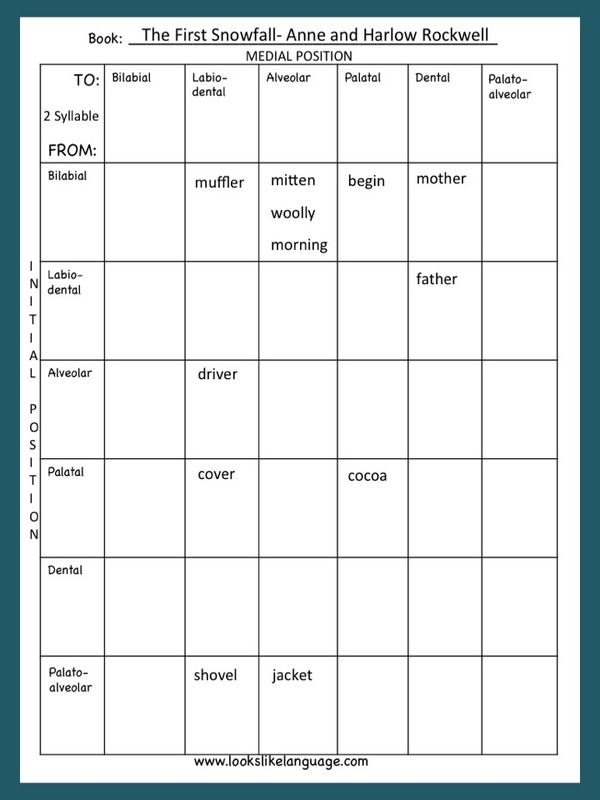 For students with motor speech problems, I found it helpful to use a worksheet to get myself organized. You can look at your targets according to manner of articulation, thinking about the movement pattern from one place of production to the next in the consonant sounds of the word. When you have students who can produce a sound in some contexts, but not in others, this may be helpful to determine what may be going on. For example, a child may be able to produce the medial /g/ in “google” because the place of production remains the same, but be unable to in the word “begin”, where the place of production changes. 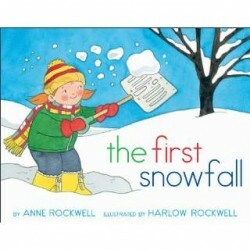 The photo on the left demonstrates how to do this using another of my favorite winter books: The First Snowfall by Anne and Harlow Rockwell. Note that this chart includes 2 syllable words from the book, looking at the movement patterns needed from the first consonant to the second. When you combine your articulation target words with the language skills to work on in a fun book, you have a quick and easy guideline for planning your follow-up activities. The best part of all? 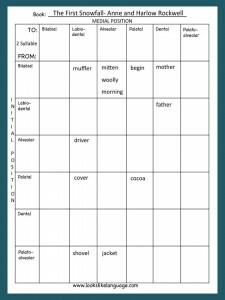 If you keep this language and articulation list, along with the book and a copy of the activities you’ve used in a page protector, it is all ready and waiting to go next year! You can download a copy to use for your own planning here. If you’d like more therapy tips, come visit me at my other blog, Looks Like Language.